Butternut squash from Mueller Farmer’s Market in Austin. 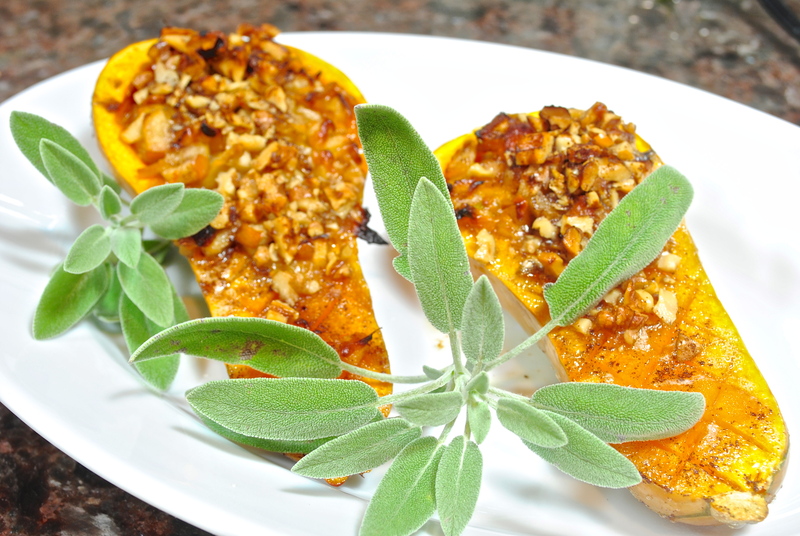 Another butternut squash recipe, that’s more than I have ever tried; but it is Fall and the perfect time for recipes made with squash. It ‘s always so much fun going to see the kids whether it’s in Austin or Chicago. I love both places and the both have really great farmer’s markets that are fun to stroll through on a Saturday or Sunday morning. A couple of months ago we were in Austin and went to the Mueller Farmer’s Market that is under an old hangar at the old airport and there was a band playing, kids and families all over the place and lots of fresh produce and meats everywhere. I bought this great goat cheese by Pure Luck called June’s Joy. It’s whipped and has honey, thyme, and pepper and is so good smeared on a little cracker or two and I cannot imagine how a good piece of warm bread out of the oven would taste with the cheese. (I should have put a dollop of that cheese on the hot squash, but didn’t.) I also found these small butternut squash, about 6″ long. Don’t ask me why I get excited over small vegetables but I usually only see butternut squash in the large size and these little ones were perfect for stuffing for individual portions and I’m always thinking these are just so cute, now what can I do with them. Some other interesting finds for the weekend were my Zhi teas and new little glass tea pot. Life without good food and new recipes would be so boring and I’m so glad I love to cook, I just need a few more mouths to feed to try my new recipes. So for this butternut squash recipe I was looking around at different recipes and took this and that from a bunch of recipes and came up with this. Hope you enjoy. If you do, please come back and post a comment below. 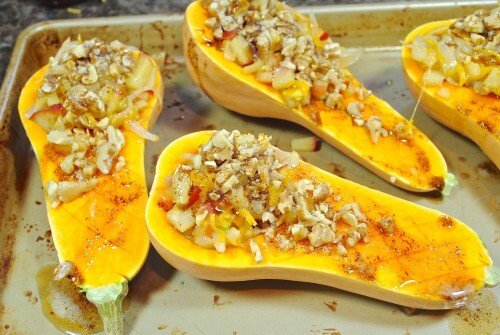 Cut squash in half and scoop out all the seeds. 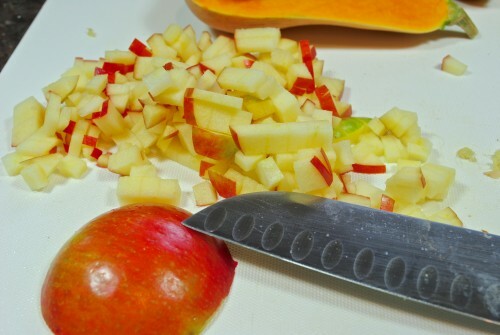 Then using a paring knife cut criss-cross sections across the squash about 1/8″ deep. 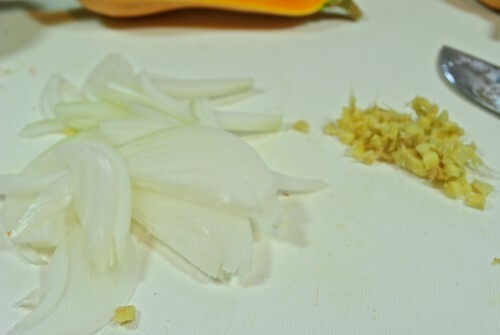 Slice the onion into thin slivers and chop the ginger. Chop apple into 1/4″ dice. 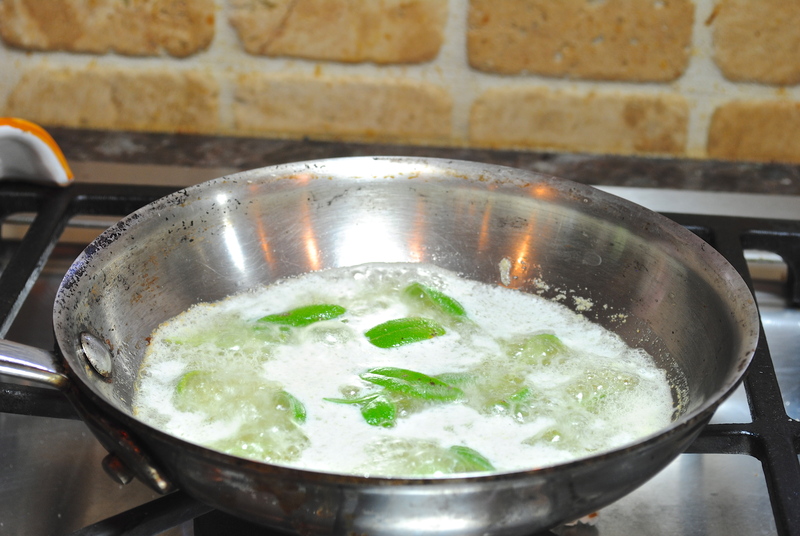 While browning the butter throw in the sage leaves and fry until crisp. I forgot to use mine as a garnish because I was too busy eating them. Stir the onions until they start to caramelize and then add in the apples. 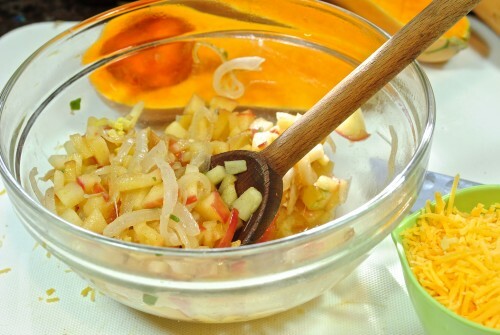 After the apples and onions have cooled, stir in the cheese. Put the cut squash on a baking sheet and drizzle with some of the browned butter. Put some of the stuffing into each of the scooped out squash and drizzle with a little more butter and sprinkle with the walnuts. Put the 1/2 stick butter in a small skillet and slowly heat it until it turns a golden brown. While the butter is browning throw int he sage leaves. When the leaves are crisp remove and save for garnish. Set butter aside. Brown the walnuts in either the microwave or in small skillet, then chop. 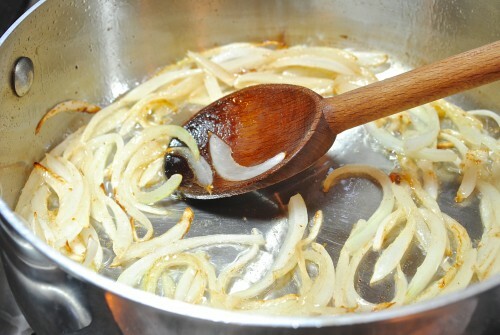 Melt the other two tablespoons of butter in skillet and add the onion slivers and cook slowly until they start to caramelize, maybe 10 minutes or so and then add in the chopped apples and stir in the chopped apples and continue cooking for another 5-6 minutes. Remove from heat and cool to room temperature. Stir in the cinnamon, walnuts, and ginger. 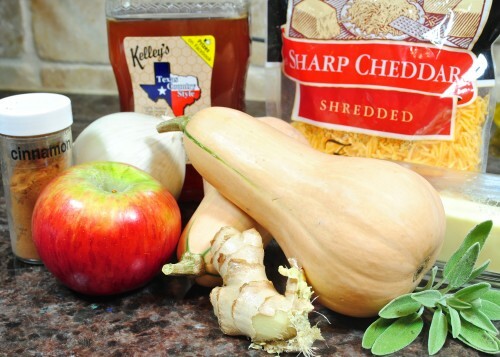 Stir to blend in seasonings and then add the honey and the grated cheese. 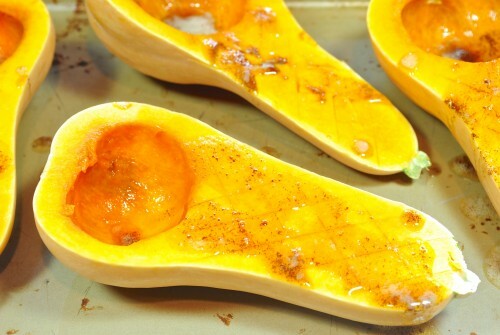 Wash the butternut squash and cut in half. Remove seeds. 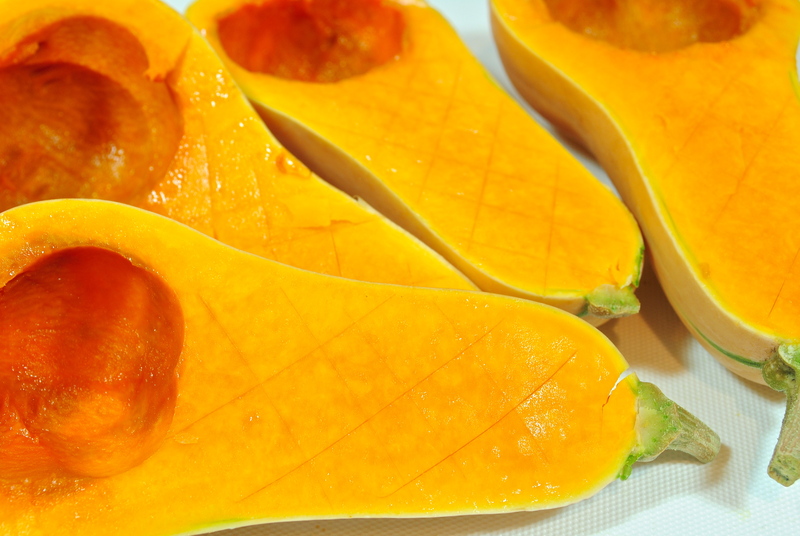 Using a sharp knife, score the squash first one way, then the other, making a criss-crossed pattern. 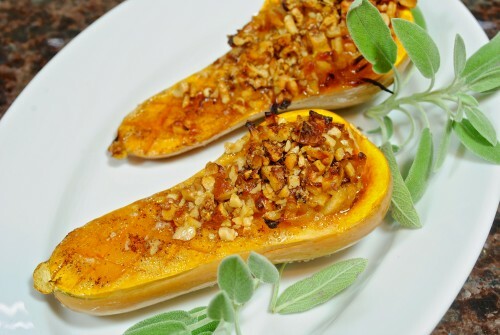 Put some of the filling into the hollow part of the squash and then drizzled the browned butter over the filling and the cuts you have made. Put in 400° oven for 30-40 minutes. 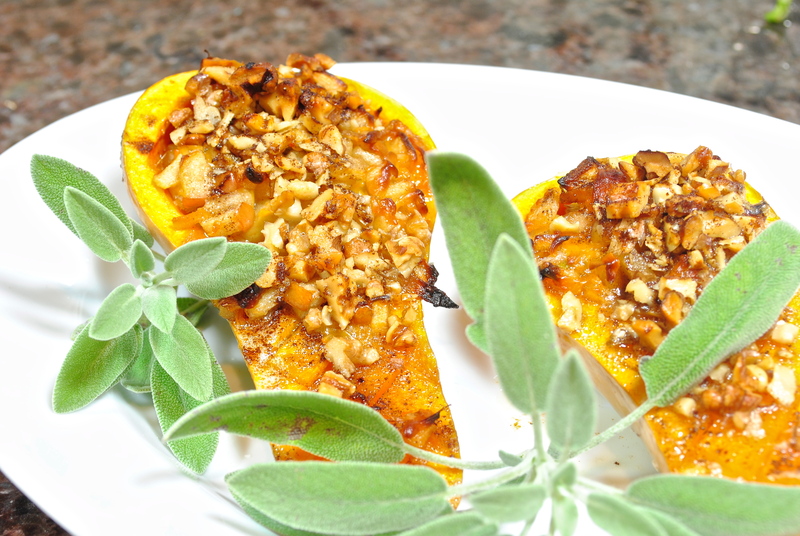 Pierce the squash with a knife or pick to see if it is done. *I think a goat cheese would be great in this or even a fontina or Parmesan. You could also sprinkle with some Parmesan cheese if you like or even some panko bread crumbs. I didn’t feel like it needed the bread.